Glad to see you were able to use the red chili pepper from the CSA bag!! I used 3 tbs (á 15 ml = 45 ml) of oil in a small skillet of 17 cm diameter and did 2 rounds of frying (5 fritters each). Maybe I could have used a little less, but not much. Of course I put the fritters on a bit of kitchen towel when they came out of the pan to drain off any excess grease. 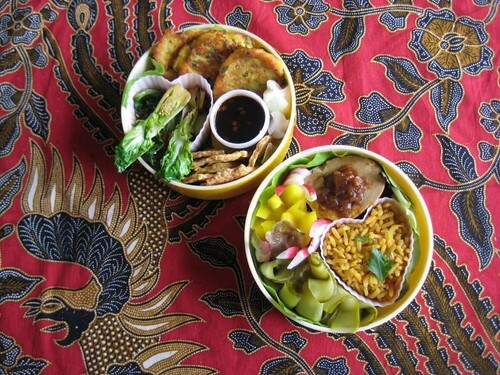 That is a nice looking Bento and you put it on Batik too…lovely. That recipe is more complicated than what I used to make. I like making Bakwan Jagung more :) it’s easier to make…ah you make me want to make it for tomorrow’s breakfast. Hehe you use the old spelling for all the food, I have to think a bit, We don’t use that spelling anymore now. Have you Tried Padang food? Bakwan Jagung is almost the same with perkedel. 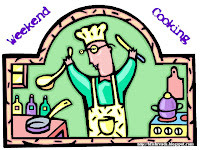 I make it in a most easy way ;) there is a flour with seasoning here, I use that instead of making my own seasoning. Put The corn and extra vegetables (mosly carrot, tauge, and cabbage … if you add these, it becomes just Bakwan – you don’t have to add jagung behind the word Bakwan) into the flour and add egg both for taste and to make it stick together. The fry it. Yeah I know, it was from that era. I believe we stop using it somewhere in 60s or 50s. Padang Food is many kind of food originally made by Padangese (I am Padangese) and yes it is serve in special way by carrying many plates at once :) Most Padang Food is spicy. Yup sometimes people call it nasi Padang. You should try ‘Rendang’…very difficult to make but very delicious….it’s my favorite Padang Food. Thanks Novroz! I *love* rendang but can’t eat it anymore because I’m a vegetarian (have been for 20 years in 2011…) When I started to eat vegetarian I decided I would make an exception for Indonesian food LOL Never did though. My father lived in Padang when he was a child and I believe he was quite happy there — it’s one of the few places I actually remember him telling us about. I plan to visit it someday! That looks great. I like to make Frikadel Djagoeng. The recipe looks almost the same. Do you know what’s the difference between Perkedel and Frikadel? Please share your recipe as well? Stunning post! The food looks intricately flavorful and so elegant in your round bentos, wow! This bento looks so tasty! I’m definitely going to try the recipe too. You can still make rendang with potato :) we use to mix meat and potato in our rendang. Hehehe…tho my blood is Padangese (both my parents are from Padang) but I was born and raise in Jakarta. That’s nice to know that your father once lived there. I visit my big family in Padang once in a while. My grandparents family are from Padang too, and my mom was born in Medan, so we all love Padang food too! The photos are simply beautiful! I want this bento for lunch or dinner today! Wow!. I can’t wait to try the recipe. I love Indonesian flavors. I will have to post my recipe for the American version of corn fritters someday. Although I must say these sounds a bit more interesting. @Mee: It’s the first recipe I’ve come across that mashes up the corn — and believe me, I’ve tried some already ;) But it actually turned out pretty well. Maybe I’ll leave some kernels aside next time to put in afterwards. I’m starting to wonder if the current word ‘bakwan’ replaced ‘frikadel’. Have you ever heard of the latter? @Novroz: Good idea: I’ll try the potato rendang sometime! In Holland rendang is usually made of (cow’s) meat only and eaten with plain rice or nasi goreng. In the restaurant, they only serve cow meat…but at home, many people try many things, such as cow liver, chicken and potato. I had never heard of ‘frikadel’ but we use the word ‘perkedel’ which I assume now is taken from the Dutch word frikadel! Perkedel for us is mashed potato, mixed with some other ingredients, then fried. Bakwan is flour mix with ingredients and fried. Just slight differences :). Your perkedel looks pretty close with what we have. maybe the recipe perkedel jagung here means you use mashed corns instead of mashed potato, which is a bit of a twist from the traditional recipe. That sounds delicious. I love the way the food looks in your images. YUMMY! What a great picture – This looks so delicious and exotic! Please tell me about the snack tempeh. Is it something you buy or did you prepare this? I love tempeh but haven’t made it for ages. I bought it and I think it’s awesome :) It can be found in Asian stores. This variety is spiced (I don’t know what with), the one I had before I believe to have been ‘plain’.